YouTube is home to hundreds of channels run by national teams, independent creators, and everything in between. 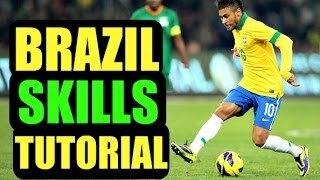 These tips can help your soccer channel win big on YouTube. Getting closer to players or sports organizations lets people develop a deeper relationship with their favorite teams. Asking players to contribute to your channel's videos can give your content an authentic and personalized flair. Produce player content: Take a look at YouTube Analytics to learn which players interest your audience most, and consider creating videos and playlists with original content around those players. Let your players in on the action: Some players have big personalities off the field: maybe a few are willing to shoot and send you their own clips for your channel. Kyle Walker pranked his Tottenham Hotspur teammates in this video that received over 2 million views and became one of their most liked videos ever. Liverpool FC’s Daniel Sturridge went back to school and surprised some of his youngest fans. 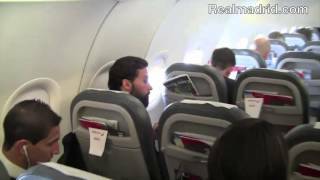 This video has kept pulling in serious views since it was first posted in April 2014. Sports fans are often looking for behind-the-scenes shots of their favorite clubs and players they can't find anywhere else. Go beyond the game: Exclusive or behind-the-scenes videos are frequently the most viewed and shared. Explore what original content - like tunnel cam shots, locker room celebrations, and training videos - you can capture for your fans. Explore your b-roll: Cool but short clips that aren’t part of major events usually get lost or passed over. Try looking through your footage for gems you haven’t used and repackage them in new videos. Real Madrid captured Cristiano Ronaldo sharing a behind-the-scenes moment with his son before the Ballon d’Or gala: the video received 1.2million views - 80% were recorded in the first 72 hours, and over 75% were from outside of Spain. McFC Official caught Mario Balotelli returning to meet his former teammates in their tunnel camera series. This series frequently hits 1 million views with watch times above 10 minutes per video. Search and suggested video are major drivers of views to soccer channels, so the right metadata - like player names, events, and adjectives - can drive this traffic to your channel. Be sure to use accurate and compelling metadata that also reflects what your fans are searching for. Optimize from the upload: Many sports videos receive the bulk of their views within 72 hours of publication. Include specific, relevant keywords in your title and description to capture search activity right from the start. Be descriptive: Try including illustrative adjectives that speak to the content and entice viewers to watch. Know what’s trending: Explore Google Trends to figure out the most-searched-on terms and topics related to your organization. Think about drafting metadata around these words or phrases to capitalize on search activity. But keep in mind that using misleading metadata is a violation of YouTube’s community guidelines. Use YouTube Analytics: Check out your Traffic sources for views in YouTube Analytics. If you click into the “YouTube search” section, it displays keywords that fans are using to find your videos. FATV drove 285K views to their Arsenal v Manchester match Goals & Highlights video by using proper metadata. Over 75% of their views came from Search and Suggested Traffic. From chants to dances, sports are filled with a bunch of fun traditions we can all be a part of. Soccer channels have seen high audience engagement by creating original content based on club rituals that fans are familiar with. Capture what they know: Many sports videos showcasing chants or other traditions receive high views and engagement because these rituals really resonate with fans. Create new rituals: Since most sports rituals exist on or around the field, think about what participatory videos are popular on YouTube and how you can create this kind of programming for your channel. 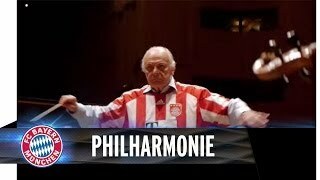 This philharmonic version of the club’s anthem reached over 650K views and became one of their most-viewed videos of all time. 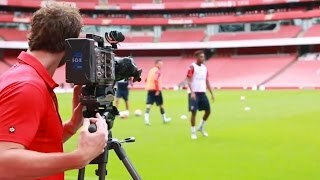 Arsenal’s Santi Cazorla, Olivier Giroud, and Laurent Koscielny conduct their fans - resulting in a video with high engagement and an average audience retention of 77%. Competition and conversation are important parts of the soccer community. And many successful channels capture the competitive side of sports by packaging adversary videos, original challenges, and repurposed archival footage. Revisit your archives: Consider what rivalries exist in your archives, including those between clubs and players, that can be cut and repackaged. Create competition: Many sports fans like watching players compete in creative ways. Try putting athletes in new and creative competitions like a drawing contest, video game challenge, or more. Rivalries between members of the same league. Challenges between members of opposing teams. Competitions between athletes from different sports. Almost 30% of major soccer clubs’ video traffic comes from direct shares and video embeds. Enabling embeds on your videos can extend your channel’s reach by encouraging fans and digital publishers to share your content with their communities. Lead the conversation: Sports fans are a highly engaged audience. Tools like hashtags and direct calls to action can drive your audience to share your content even more. Collaborate with influential community members: Soccer videos are frequently embedded on the same sites. Try collaborating with creators and websites that produce and distribute content, and make sure you inform them about your publishing schedule, too. Paris Saint-Germain’s video of Zlatan Ibrahimovic’s incredible 360° panna trick received over 1.9 million views from embeds alone, which drove an additional 1.75 million from the Guide and Direct traffic. Focus on what your audience likes: Check YouTube Analytics to determine which types of videos drive the most audience retention - maybe it’s clips of goals, players doing a victory dance, or something completely unique to your league. Upload quickly: Game highlights frequently receive upwards of 75% of their views within 72 hours of publication. Adopting a publishing schedule can ensure you’re releasing time-sensitive game content as quickly as possible. Improve discovery: When searching for highlights, fans typically search for specific moments. Consider how you might best edit the footage and use metadata and thumbnails to help fans find your video. Guide them to key moments: For long-form game footage, try using timecodes in the video description to help fans navigate to segments they’re looking for. La Liga draws high views by uploading highlights immediately after the game, using compelling thumbnails and metadata, and then engaging with their fans through comments. 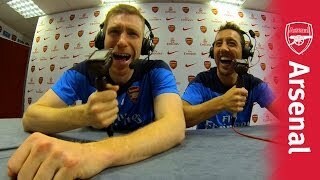 Arsenal’s UnClassic Commentary series lets their players create original voiceovers for game footage; these often bring in higher view counts than traditional highlight videos. Soccer fans often curate their own viewing experience through suggested videos - which can account for nearly 20% of views for top channels. Organizing and suggesting videos for your fans by creating playlists or compilation videos with archived footage can be a good way to keep fans engaged. Repackage your inventory: Many of the most-viewed soccer videos are compilations of historical clips. Consider piecing together older footage into a compelling collection. Create playlists: Playlists contribute to an increasing amount of traffic for soccer channels. Think about how best to organize your videos and arrange them into original, thematic playlists. Promote related content: Consider including cards or end screens that point to related content on videos with high audience retention rates. Their Top 10 and Top 5 series, including the breakout Top 10 Goals - Against Former Clubs, account for many of their most-viewed videos. AFC Ajax produces a Top 10 player goal series that continues to attract viewers years after publication. Soccer enthusiasts want to know how their idols do it. And many top sports creators grow their audiences by producing how-to and training videos that teach viewers what it’s like to train or play like the pros. Follow what’s trending: Fans’ interest in tricks and skills peak when they’re used in games. Consider creating tutorials around specific plays while interest and search activity is high. Sky Sports captured Chelsea’s Petr Cech preparing for an upcoming match in this goalkeeping drill that received over one million views. The SkillTwins have grown an audience of >2M subscribers by producing skill tutorial videos - many of which achieve very high views. Many soccer organizations experience increased audience retention and views by directly involving their audience. Organizations that maintain an active dialogue with their fans often see a higher percentage of active subscribers. Get players involved: Some successful channels ask players to record a call to action for their fans. Involve your audience: Consider formats that let your fans participate in production. Cultivate a conversation: Try out different platform features to help you interact with your audiences, like Comments and Community posts. 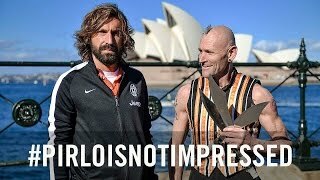 Juventus played on Andrea Pirlo’s serious reputation by creating the #PirloIsNotImpressed video asking fans to submit their own footage. This video received over one million views and many fan submissions.